There are some books where you know right away, within the first few pages, that you're in the hands of a master storyteller and it's going to be a helluva ride. Of course, it pushes all my "like" buttons from the get-go, as my list of "shelves" will attest. (This is descriptions/categories of any book reviewed, for those not up on their Goodreads lingo.) Post-apocalyptic, dystopia, science-fiction, psions, young-adult...all the stuff I love to write, and desire even more to read. Except that I could never come up with a story and a world like this. Imagine a world where a plague has killed most of the children in the United States, and a high percentage of those who survived have developed psychic powers. Telepathy, telekinesis, pyrokinesis, and a form of pyrokinesis that uses electricity from the teen's brain to short out, fry and literally melt technology. The government, in its infinite wisdom regarding these "freaks," rounds them up and confines them in concenration camps. Can't happen, you say? Tell that to Japanese-Americans durng World War II. But besides this, Alexandra Bracken provides quite a convincing explanation for what would normally be regarded as a horrifying curtailment of civil liberties and a persecution of one group of people on a scale of Naziism. She says that in the aftermath of the plague, the United States defaulted on its debt, and as a result the entire world economy crashed. When things get that bad, people need a scapegoat. In Alexandra Bracken's world, the mutated children, the "freaks," provide quite a handy one, and no one is terribly upset by their persecution, except the teens themselves, of course. There's a couple of different factions freeing individual teens from the camps (including the telepathic heroine, Ruby, with her unique ability to share people's memories and also remove herself from them), but we soon learn said factions have their own agenda and cannot be trusted. There are layers and layers of intrigue here, and especially in the latter third of the book (where the author's careful planting and pacing comes to a marvelously explosive conclusion) one must read carefully to keep track of the evolving twists. Ruby is also a wonderful character, and following her growth is an epic journey. She opens the book so beaten down by her six years in the concentration camp (and her own horror at the first burst of her unfolding powers, when she erased herself from both her parents' minds) that she does not speak up to help or save a fellow inmate, and as a result the other girl is tortured because of Ruby's silence. This plays on Ruby's mind throughout the entire book, and provides the impetus for her to seek out someone to help her learn how to use her powers. Which only gets her, and the small group of escapees from another camp she has fallen in with, into ever deeper trouble...you'll just have to read the book to find out. Suffice to say that at the bittersweet ending, she has made a complete turnaround, and will let no one take the fall for her again. In short, this is one of the best young-adult books I've read this year. I checked this one out from the library, but you can rest assured I'll be purchasing it, along with its sequels. 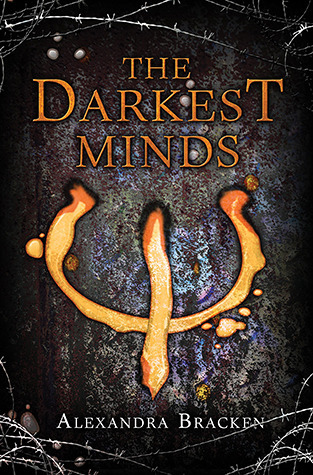 Sign into Goodreads to see if any of your friends have read The Darkest Minds.